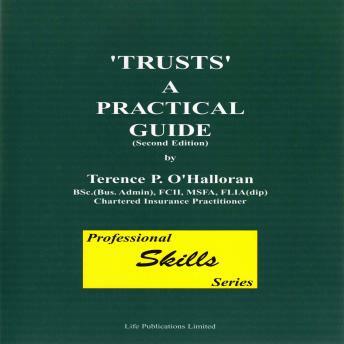 Within the genre of financial selfhelp, 'Trusts A Practical Guide' is an invaluable and rare resource for financial experts and members of the public alike who need a reference work on a subject that is, on the face of it, complex but which undeniably affects many people's lives at one point or another. Whatever your occupation or background, you are almost certain at some time to need some understanding of this subject, whether in your own financial planning or in advising those around you - and this guide is particularly helpful when dealing with a relative's probate or the complex issues arising from an inheritance. After thirtyfive years at the top of his profession, FSA member Terry O'Halloran writes passionately and informatively, not only about his subject but also about the importance of spreading the word to others. He has seen many times first hand the benefits of well organized and implemented financial planning on people's lives. More poignantly, he has seen what can happen when such matters are left to chance.